Hidden Figures: The American Dream and the Untold Story of the Black Women Who Helped Win the Space Race is a 2016 non-fiction book written by Margot Lee Shetterly. Shetterly started working on the book in 2010. The book takes place from the 1930s through the 1960s when women were still viewed as inferior to men. 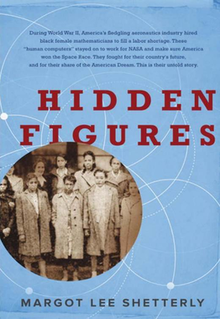 The biographical text follows the lives of Human Computers such as Katherine Johnson, Dorothy Vaughan, and Mary Jackson, three mathematicians (known as "human computers") who overcame discrimination, as women and as African Americans, while working at the National Aeronautics and Space Administration (NASA) during the Space Race, as well as Christine Darden, who was the first African-American woman to be promoted into the Senior Executive Service for her work in researching supersonic flight and sonic booms. The book reached number one on The New York Times Non-Fiction Best Sellers list and got the Anisfield-Wolf Book Award for Nonfiction in 2017. The book was adapted as a film by the same name, released in 2016, that was nominated for three Oscars. It received numerous other awards. Hidden Figures tells the story of three African-American women who worked as computers to solve problems for engineers and others at NASA. For the first years of their careers, the workplace was segregated and women were kept in the background as human computers. Author Margot Lee Shetterly's father was a research scientist at NASA who worked with many of the book's main characters. The book explains how these three historical women overcame discrimination and racial segregation to become three American achievers in mathematics, scientific and engineering history. The main character, Katherine Johnson, calculated rocket trajectories for the Mercury and Apollo missions. Johnson successfully "took matters into her own hands"; by being assertive with her supervisor; when her mathematical abilities were recognized, Katherine Johnson was allowed into all male meetings at NASA. The book was adapted as a film of the same name, written by Theodore Melfi and Allison Schroeder, and directed by Melfi. It was released on December 25, 2016 to positive reviews from critics, and received a nomination for Best Picture at the 89th Academy Awards. It received numerous other nominations and awards. Taraji P. Henson starred as mathematician Katherine Johnson, and Octavia Spencer played Dorothy Vaughan, an African-American mathematician who worked for NASA in 1949. The movie made 231.3 million USD (United States Dollar). The budget of the film was 25 million USD. While the film is based on the book, author Margot Lee Shetterly agrees that there are differences between the two, and she finds that to be understandable. For better or for worse, there is history, there is the book and then there's the movie. Timelines had to be conflated and [there were] composite characters, and for most people [who have seen the movie] have already taken that as the literal fact. ... You might get the indication in the movie that these were the only people doing those jobs, when in reality we know they worked in teams, and those teams had other teams. There were sections, branches, divisions, and they all went up to a director. There were so many people required to make this happen. ... It would be great for people to understand that there were so many more people. Even though Katherine Johnson, in this role, was a hero, there were so many others that were required to do other kinds of tests and checks to make [Glenn's] mission come to fruition. But I understand you can't make a movie with 300 characters. It is simply not possible. In 2016 a Young Reader's Edition was released for readers 8 - 12. A Hidden Figures picture book was released in January 2018. The book was co-written by Margot Lee Shetterly for children from four to eight years of age. ^ a b Howell, Elizabeth (January 24, 2017). "The Story of NASA's Real "Hidden Figures"". Scientific American. Retrieved January 26, 2017. ^ "Author Q&A: Margot Lee Shetterly reveals NASA's 'Hidden Figures'| collectSPACE". collectSPACE.com. Retrieved 2017-10-09. ^ Scott, A. O. (2016-12-22). "Review: 'Hidden Figures' Honors 3 Black Women Who Helped NASA Soar". The New York Times. ISSN 0362-4331. Retrieved 2017-10-09. ^ "Hidden Figures and Human Computers". National Air and Space Museum. 2017-01-26. Retrieved 2017-12-03. ^ "Katherine Coleman Goble Johnson". School of Mathematics & Statistics University of St Andrews, UK. School of Mathematics & Statistics University of St Andrews, UK. Retrieved March 1, 2017. Excerpt from W. Warren, Katherine Coleman Goble Johnson, in Black Women Scientists in the United States (Indiana University Press, 1999), 140-147. ^ Shetterly, Margot Lee (2016). Hidden Figures. William Morrow. p. 129. ISBN 9780062363596. ^ "New York City African-American Business Leaders Partner with Google, Facebook, AT&T and 20th Century Fox to Inspire 25,000 Students with Tickets to Hidden Figures". PR Newswire. January 6, 2017. Retrieved January 26, 2017. ^ "'Hidden Figures': How Black Women Did The Math That Put Men On The Moon". NPR. September 25, 2016. Retrieved January 26, 2017. ^ a b c Busch, Anita (January 6, 2017). "'Hidden Figures' Filmmaker Ted Melfi Added Something Extraordinary To The Equation". Deadline Hollywood. Retrieved January 24, 2017. ^ Noel, Melissa (September 6, 2016). "New Book 'Hidden Figures' Reveals Black Women Who Helped The Space Race". NBC News. Retrieved January 26, 2017. ^ "Oral History Archive: Katherine Johnson". National Visionary Leadership Project. 2005. Retrieved December 29, 2016. ^ a b c Buckley, Cara (2016-09-05). "On Being a Black Female Math Whiz During the Space Race". The New York Times. ISSN 0362-4331. Retrieved 2017-10-09. ^ Mesidor. "Black Girl Magic History: 8 Facts You Should Know About The Real 'Hidden Figures'". essence.com. Retrieved 2017-12-26. ^ Verhoeven, Beatrice (January 9, 2017). "'Hidden Figures' Dethrones 'Rogue One' With $22.8 Million Weekend". The Wrap. Retrieved January 24, 2017. ^ "Dorothy Vaughn (Character)". IMDb. Retrieved 2017-10-09. ^ Pearlman, Robert Z. (December 27, 2016). "'Hidden Figures': 'The Right Stuff' vs. Real Stuff in New Film About NASA History". Space.com. Purch. Retrieved March 2, 2017. Shetterly was still writing her book when production of the film began — it was only just released in September — but she was also available to the filmmakers as they sought to condense a story spanning a few decades into their setting of just a couple of years. ^ Gilmore, Natasha (January 12, 2017). "Young Readers' Editions on the Horizon". PublishersWeekly.com. Retrieved 2018-05-19. ^ Ha, Thu-Huong. "A children's picture book of "Hidden Figures" is coming". Quartz. Retrieved 2017-10-09. This page was last edited on 11 March 2019, at 18:45 (UTC).